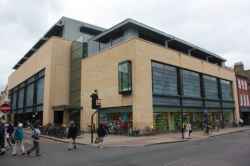 John Lewis is a department store selling a variety of clothing, furniture and homewares for different rooms in the house. Based in Grand Arcade, 10 Downing Street, John Lewis is a department store. John Lewis is in Grand Arcade 10 Downing Street. You can view a list of neighbouring businesses by going to the Grand Arcade page. Note: the pin is positioned at the postcode centre, and may not correspond with the precise location of Grand Arcade, 10 Downing Street.